If you’ve been searching for a Ford dealership that offers all the exciting new technology available on Ford vehicles, then you can be sure you will find it at Roesch Ford in Bensenville, IL. The technology available in today’s Ford models, like the 2017 Ford Escape Titanium, is smarter than ever in assisting drivers. Imagine driving down the road in this SUV knowing that the available technology will alert you if you begin to drift the slightest bit out of your lane. A forward facing camera sends a signal to the steering wheel, causing a gentle vibration that warns you to get back on track. When necessary, it can also apply steering torque to help you stay in your lane. If the system senses repeated drifting, it will send a picture of a coffee cup to your message center. How’s that for smart technology? The technology in the 2018 Ford Escape can also help you park in those hard to fit spots. An available Enhanced Active Park Assist system uses ultrasonic sensors to scan for the perfect space, then alerts you and guides you in. Park Out Assist can lead you out of tight spots as well. An EcoBoost® engine that features Auto Start-Stop Technology will help you save on fuel costs. And when your hands are full and there’s no one around to open the liftgate for you, just give a gentle kick under the rear bumper and the available Technology Package in this 2017 Ford Escape will open it for you. Want to learn more about these great technologies? 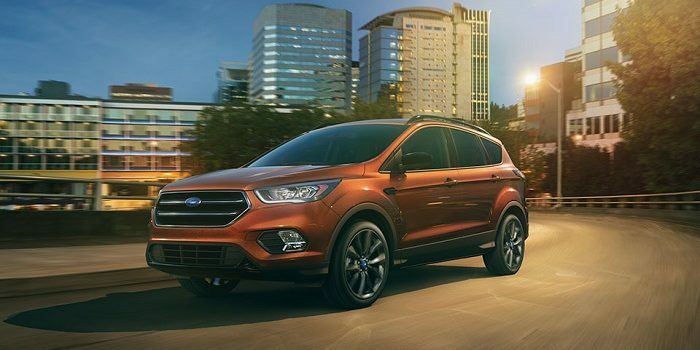 Come and see for yourself how these features work in person by visiting our Ford dealership near Chicago and take the 2017 Ford Escape Titanium for a test drive.